Big FM 101.2 live broadcasting from Pokhara, Nepal. 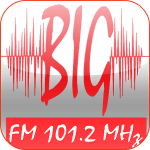 Big FM 101.2 is one of the most famous online radio station on Nepal. With the theme of ‘Big Information, Big Entertainment’ BIG FM 101.2 MHz is On-Air since March 2009. We are running in mixed format by way of multiple media contents like News Bulletins to Talk shows, Call-ins to Music base programs, Game shows to Reality base competitions. It is run by radio professionals and young entrepreneurs who have more than 12 years of experiences in radio and journalism. Mixed (info-mercial, Info-tainment, Info-edu-tainment) etc.